March 21, 2014 marked the 150th anniversary of the Nevada Enabling Act, passed by Congress to authorize the Territory of Nevada to move forward with writing a state constitution. In the fall of 1864, Nevada voters approved the constitution and President Abraham Lincoln proclaimed Nevada as the nation's 36th state on Oct. 31, 1864.
unique part of the history of the frontier." During the Gold Rush to California, miners on their way to the gold fields west of the Sierras occasionally stopped in Gold Canyon in western Nevada to mine the small deposits of gold they found there. This practice did not prove to be very profitable because of some persistent "blue-stuff" which hindered their mining. Most of the prospectors left and went on to California, but a few placer miners stayed on. In the early 1850s, there were only about one hundred eighty miners in Nevada. In the spring of 1857, the Grosh brothers, Hosea and Allen, came to Nevada from the goldfields of California and built a cabin far up Gold Canyon. The brothers located the rich silver ledges later to be called the Comstock Lode and realized their potential value, but did not have any money to work their claims. To support themselves, the brothers worked at placering gold, and found some people to back their operation. "On the result of that assay hung the fortunes of thousands, national welfare; the future of a race, the outcome of a great war! Out of that assay sprang dozens of millionaires! A telegraph cable to girdle the earth! A State--Legislation--a great mining school--a mining code! Engineering enterprises that were to make the mountain famous ! Out of that assay sprang the pomp of kings , the power of principalities , the, glitter of coronets! Out of that Little beaker came a giant of the earth more powerful and relentless than the awful specter that sprang from the pan in the Arabian tale; and that giant still lives, still makes, still breaks. the destinies of countless thousands." There seemed to be a vengeful Nemesis guarding Sun Mountain, the mountain where the Lode was discovered, because the Grosh brothers , as well as the other early miners of the Lode, met with bad luck. In the summer of 1657, Hosea Grosh buried the edge of a pick in his foot and died of gangrene in September 0f that year. That same winter, his brother Allen left on the way to California for the winter, but he and his companion were caught In a storm, and they were nearly frozen when they staggered into a Mexican's mining camp where Allen subsequently died from exposure and gangrene. An itinerant sheepherder and trapper from Canada named Henry T.P. Comstock came into Gold Canyon and claimed the discovery. Some say he had been a watchman for the Grosh cabin. He had evidently found the ore samples and papers left by the Groshes. When he heard of their deaths, he claimed their cabin and lands as his own. Without working himself, he watched the progress made by other miners, and when they discovered rich ore, he claimed the water that was needed to help mine it. He also claimed the ground of other miners. In the Spring of 1859, two miners, Peter O'Riley and Patrick McLaughlin found what was to be the beginning of the lode. When Comstock learned of the two men working on the strike he claimed that he had already claimed the land for "grazing purposes". Comstock made threats and managed to work himself and his partner, Immanuel "Manny" Penrod, into a deal that granted them interest in the claim. Of all the men connected with the discovery of the Comstock Lode, Henry Comstock, the man for whom it was named, probably least deserved the honor, his only qualification being that he was the most persuasive talker in the Washoe Valley. The early miners of the Comstock voluntarily sold their claims for very small sums, considering the millions that were to come from the mines. Comstock sold his claims for $11,000; Alvah Gould sold for $450; Peter Riley made the best deal of the group, selling his interest for $40,000; and Pat McLaughlin, Penrod, and Osbourn sold their shares for from $3,000 to $8,500. Successive finds and volitile stock gambling kept the Comstock Lode at a higher pitch for a longer period than other western camps. The depth of the ore veins gave Virginia City a permanence that the California placer mining camps and most of the Nevada hard-rock mining camps never knew. As a result of so many companies and individuals selling ground on the Comstock Lode, the San Francisco Stock and Exchange Board was organized in 1862 to trade mining stocks. There were five main boom periods in the history of the Comstock , The first boom occurred in 1859 with the primary discovery of the surface ledges of the Lode. During this boom, the main ore bodies were the Ophir and the Gold Hill bodies. The 1860 census showed that in that year there were 2,500 permanent citizens living in Virginia City alone. This did not count the steady influx of transitory miners. On January 16, 1861, the budding Virginia City was incorporated by an act of the Utah legislature. Corporate powers were vested in a board of five trustees who were to provide proper government and law for the town. With the discovery of the Comstock Lode and other related mineral deposits, miners swept into the Carson Valley. As a result, the citizens of the area wanted Nevada to become a separate territory from Utah. A delegate took a sample of rich ore from the Comstock mines to Washington and asked in behalf of the citizenry that the Nevada Territory be created. On March 2, 1861, Congress passed a bill officially separating Nevada from Utah. During this time, David Terry, a southern supporter, came to Virginia city allegedly carrying a commission as governor of Nevada from Jefferson Davis as soon as he could bring the state into the Confederacy. His plan did not work, but he did succeed in rousing enough Southern feeling that the soldiers from Fort Churchill had to be called to tear down a Confederate flag flying over a Virginia City saloon and confiscate arms of supporters. In the winter of 1861, a panic caused by wild speculation on often worthless stock set in, and the bottom fell out of the Comstock market. Bad storms that same winter wiped out much of the wealth not lost in the stock crash. The Comstock recovered from its first decline with the discovery of new ore bodies in 1863. These new discoveries constituted the second boom of the Virginia City mines. By 1864 a complete pattern of city life had been established in Virginia City. There were straight streets with the business section centered on C Street. Above C Street were the residences of the merchants, mining officials, and the richer families. Below were a Chinese section, the homes of poor miners, an elaborate "red light" district, and huts of the Washoe and Piute Indians who lived off the leavings of the town. City land had been divided into lots, and preferred frontages of from forty to fifty feet wide sold for from $10,000 to $20,000. For Nevada, statehood was the only solution to its problems of corruption and lawlessness. As a state, it could elect its own officials and be able to hold them responsible for their acts. Nevada statehood would also prove to be a solution for many Union problems. Its gold and silver were much needed for financing the Civil War, the Nevada route to California sorely needed military policing, and President Lincoln needed Nevada's three votes to help pass the Thirteenth amendment to the Constitution. President Lincoln said of Nevada statehood: "Here is the alternative; that we carry this vote, or be compelled to raise another million and fight no one knows how long. It is a question of three votes or new armies." On October 31, 1864, President Lincoln proclaimed Nevada a state of the Union in time for its citizens to vote in the national elections of that year. was reelected in 1887 and served until he retired in 1905. Steward had helped Nevada through the Paiute War, helped it become a territory, forced the resignation of an entire bench of corrupt territorial supreme court judges, supported a four dollar a day wage for miners, shaped the United States mining statutes, wrote the Fifteenth Amendment to the Constitution, backed the establishment of a mint at Carson City, and opposed the rise of huge fortunes, as well as winning much litigation between the Comstock mines. The miners' union had been established and for two decades it kept the miners' wages at a high (for that time) four dollars a day. The union also forced the Nevada Legislature to pass the first eight-hour shift law for mine work. During this time, several unusual journalists won for the Comstock at first regional and later national glorification. 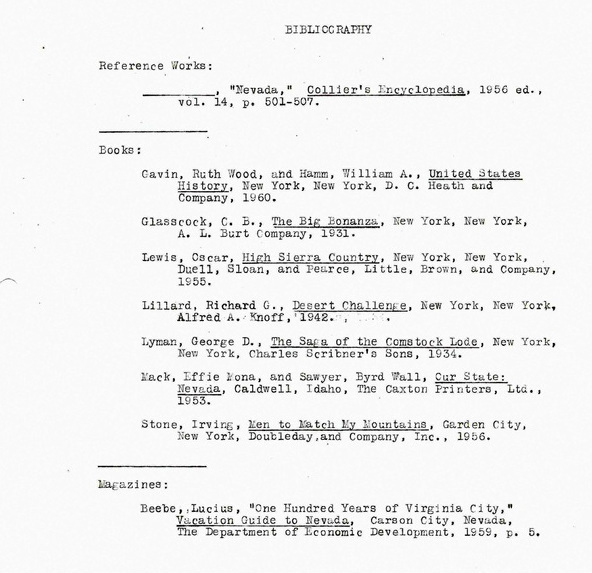 Among these writers was Samuel Clemens, who wrote under the name of Mark Twain. He worked for the Virginia City newspaper, the Territorial Enterprise, for a period of two years during which he gathered material for stories and his famous book, Roughing It. William Wright, known as Dan DeQuille was also a popular story writer and reporter on the Enterprise staff from 1862 until the paper was suspended in 1893. The second Comstock boom ended in panic in late 1865, after the ore bodies were found to supposedly terminate at five hundred feet deep. The third boom began in 1866. By the mid-1860s, Comstock business became snarled. In 1864 William Sharon came to Virginia City and established a branch of W. C. Ralston's Bank of California there. Sharon was a shrewd businessman. He loaned money to distressed mines and when they could not pay, he foreclosed. This produced a monopoly company owned by the Ralston Ring, called the Union Mill and Mining Company. In 1869 William Sharon built a railroad to Virginia city from Carson City. Sharon also owned half interest in the railroad from Reno to Virginia City. The controllers of the Central Pacific Railroad were awarded the contract to lay a railroad over the Sierra Nevada Mountains because of the need for an adequate northern crossing to make Virginia City more easily accessible. On April 7, 1869, the Crown Faint and Yellow Jacket mines caught fire underground, causing the worst mining disaster in America up to that time. Between thirty five and forty miners were killed. In 1870, the third boom subsided since no new ore was found below 1000 feet. Most of the mines stopped production. The fourth boom began in 1870, and lasted until 1872. It ended when low grade ore was discovered in the Consolidated Virginia mine at the 1200 foot level. About 1871 James G. Fair, James C. Flood, John W. Mackay, and William S. O'Brien began buying into Comstock mines and purchasing the undeveloped portions of ground that were located between the formerly rich mines. These men were to become the Comstock "Silver Kings." By February of 1872 these four men had secured control of thirteen hundred feet of ground lying between two of the most productive early mines, the Ophir and the Gould and Curry. This area was known as the Consolidated Virginia. Fair and Mackay ran a tunnel from the bottom of the Gould and Curry mine under their ground. In October of 1872 Fair and Mackay invited Dan DeQuille to go down into the Consolidated Virginia mine for a scoop. He came up with samples of ore which assayed an average of $380 ton, almost ten times richer than the average assay of other Comstock ore. This cache of ore was the last, but largest boom of the mines. William Sharon and William Ralston felt cheated of the great wealth of the find, so they decided that the neighboring Belcher mine should logically have a continuation of the big bonanza hidden deep beneath it. They bought up all the stock of that mine for $10,000, sent in crews to deepen the shafts, and took $35,000,000 worth of ore from its interior. The Belcher discovery made William Sharon one of the three richest men in the Far West. To add prestige to his financial position Sharon decided he would be elected to the United States senate, so he could wield political power over the Comstock. But Joseph Goodman, editor of the Territorial Enterprise, backed by many Comstock miners, decided to not let Sharon have the office uncontested. To strike back at his opposition Sharon threw a huge block of Comstock stock onto the market, causing a feverish selling wave, and the loss of about $50,000,000 in paper value. The trick had not worked as he had planned; it had backfired against San Francisco. Sharon became hated by thousands who had lost funds through his market depression. He was indicted for conspiracy and Ralston demanded that he resign from the senatorial race. Sharon was elected as a Republican to the United States Senate for Nevada and served from March 4, 1875, to March 4, 1881. He served as the chairman of the Committee on Mines and Mining in the 45th United States Congress. By the year 1880 this last bonanza of the Comstock had produced about $135,000,000 in gold and silver. Conditions in the Virginia City mines were often hellish. At the fifteen-hundred-foot level where the richest ores were found, the men had to wear special helmets and heavy boots to protect them from cascading rocks and the boiling earth. With temperatures of 134 degrees, no man could work for more than fifteen minutes without taking a break to a cooling station. In the year 1875 alone, the Consolidated Virginia mine consumed two million pounds of ice; the daily allotment of ice to each man was ninety-five pounds. dropped silver dollars from the list of coins. This act was known as the "Crime of '73. After that, the price of silver went down, and many Comstock mines began to close because it became unprofitable to keep them open. On January 7, 1875, the market value of the Comstock had reached the high of $300,000,000. In 1876, the Comstock's total stock valuation was worth more than the total assessed value of the City of San Francisco, which had over a quarter million people. From 1875 to 1877 mines were reaching strata of inferior ore, so the mine owners began to unload stock. By 1881 the market value of the Comstock was, down to $7,000,000. A few years later much of the stock was worthless. 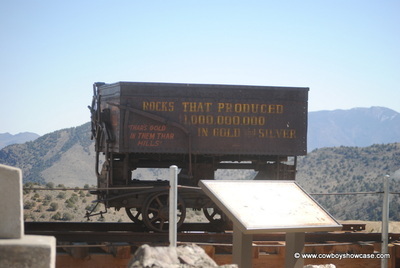 The Comstock Lode was the richest known deposit of silver in the world. Between 1860 and 1890 its mines yielded $340,000,000. However, only a small portion of the fabulous Virginia City mines were ever particularly profitable. Peak production from the Comstock occurred in 1877, with the mines producing over $14,000,000 of gold and $21,000,000 of silver that year. Population in Virginia City, at its peak, reached 25,000 people and perhaps upwards to 40,000 including adjacent Gold Hill and Silver City. The four "Silver Kings," Mackay, Fair, Flood , and O'Brien still retained a major portion of the $108,000,000 that they had taken from their mines before the failure of the lode. James Fair bought a seat in the United States Senate with his fortune. William O'Brien did little with his share, beyond supporting relatives. James Flood used his share to buy San Francisco real estate until he owned much of the city. Only one family which made its money from the Comstock Lode has returned anything to the state. That is the family of John W. Mackay. During his lifetime Mackay was very charitable, and after his death in 1902 his wife and son gave several million dollars in his memory to found the Mackay School of Mines in 1908 and erect the Mackay Science Building at the University of Nevada in Reno. John Mackay also backed the Commercial Cable and Postal Telegraph company by means of which he broke the Western Union monopoly. Another of the mine owners who made a fortune from the Comstock was "Sandy" Bowers who married Eilley Orrum Gowan, the "Queen of the Comstock." Their mine netted $10,000 a month for three years. From the profits of this mine they built the famous Bowers Mansion which cost a least a quarter of a million dollars, and took a European trip which Mrs. Bowers turned into a giant spending spree. The Bowers squandered their fortune within a few years. 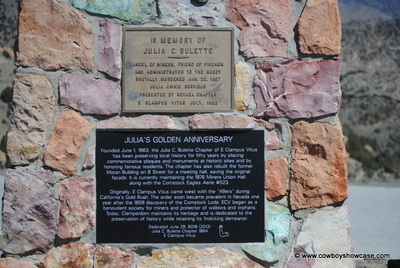 During the two decades of the Virginia City life cycle, many famous people from all over the world came to see the renowned city, the mines, the famous bars, clubs, and Piper's Opera House. These visitors included former President Grunt; President Hayes, and foreign nobility. Many great engineering feats were accomplished during the Comstock era. Water for Virginia City was piped 35,000 feet from Lake Marlette in the Sierra Nevada Mountains. The pipeline had to go down through Washoe Valley and up Mount Davidson to Virginia City, which is about 1,500 feet above the valley. Philip Diedesheimer, a German engineer who had gone to California during the gold rush, invented the square-set system of timbering the mines to prevent cave-ins which were a serious problem in the early mines because of the soft, crumbly nature of the silver ore. There was no timber on barren Mount Davidson, so lumber for timbering the mines had to be hauled long distances. To remedy the situation, a V-shaped flume was constructed to float the logs from the Sierras to the Washoe Valley. Another German mining expert, Adolph Sutro, conceived the idea in 1860 of running a tunnel horizontally into Mount Davidson, then sinking a shaft from the other workings to meet it. This tunnel would insure proper drainage and ventilation of the mines. In 1878 Sutro completed the main section of his tunnel after many years of opposition and hardship. By that time, however, the Comstock mine had gone deeper, using newer improved pumps so the main uses remained drainage and ventilation rather than ore movement. The tunnel was built from near Dayton on the Carson River to the 1,640 foot level of the Virginia City mines . The tunnel was over twenty thousand feet long. Upon completing the tunnel, Sutro worked it for a year, using it as an exit for mined ore. After paying the debts incurred In building the tunnel, he sold his interest for over $2,000,000. Then Sutro went to San Francisco , where he became that city's heroic reform mayor . The technology of mining was greatly improved during the years of the Lode. Some of the other inventions developed or experimented with in the Comstock mines were compressed-air drills for tunneling, , electric signals, giant powder cartridges, pressure ventilation , steam hoists, safety elevator cages, and the largest, most efficient water pumps of the time. The deepest depth was struck, in 1884, in the Mexican winze at 3,300 ft below the surface. When the Comstock mines finally closed, there was no industry and little agriculture or ranching to support Virginia City, so most of the residents drifted away. 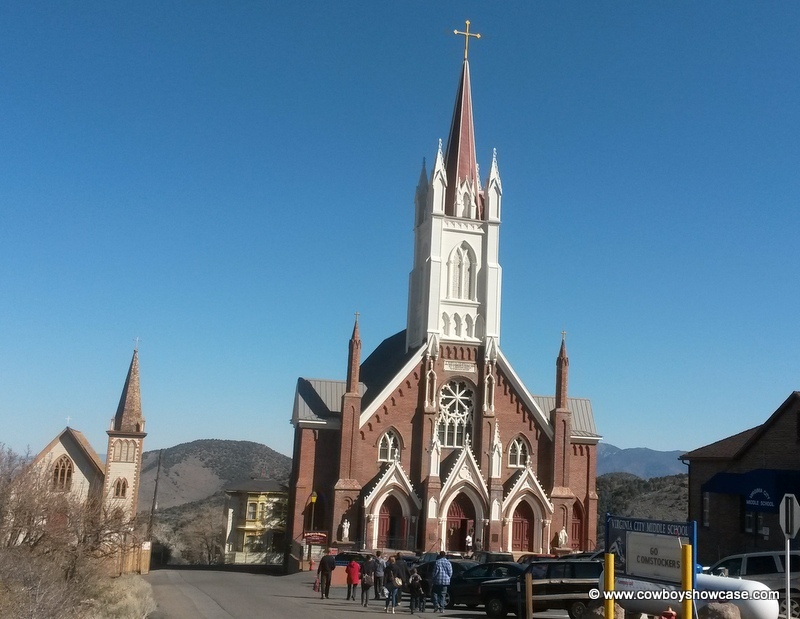 During the climactic 1880s, Virginia City and its residents were stripped of their riches and the glory of the reign of the "Queen of the Comstock," but its history did not end there. Mining in Virginia City continued over the years, with a total value through 1940 of over $400,000,000. Its wealth stimulated a constant search for new are bodies and types of ore. 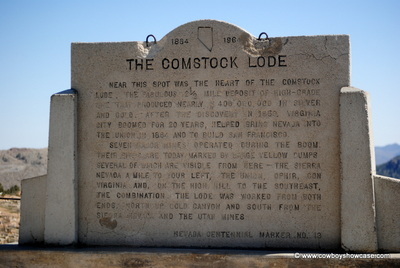 In 2014 the Comstock Lode is being explored by Comstock Mining Inc of Virginia City, Nevada who has consolidated control of approximately 70% of Comstock mining claims. On September 30, 2012 Comstock Mining Inc returned gold and silver production to the Comstock with their first pour of gold and silver and continues controversial surface mining in lower Gold Hill. Virginia City itself, part of the largest federally designated Historical District in America, still lives today as what was billed for a time as, "The World's Liveliest Ghost Town." Thousands of visitors a week visit this Mecca of the Old West which still remains much as it actually was one hundred fifty years ago during the "Big Bonanza."